Interested in surveying for nightjars? Visit our NEW Nightjar Atlas at www.nightjar.ca to check available routes and sign-up to survey. Zoom in on the Nightjar Atlas map to view the available survey routes in your area. Most routes follow established Breeding Bird Survey routes. Hover your mouse over the available route you’d like to adopt. Create an account on the WildResearch Nightjar Atlas to sign up for your route. Download your route map and station locations from the atlas under the “Manage My Routes” section. Download and review the survey protocol. Fill out the Nightjar Survey waiver form or become an annual WildResearch Member. Survey your route using the Nightjar Survey datasheets. Enter your data on the WildResearch Nightjar Atlas using your account. Have questions? Contact your Regional Coordinator! Anyone with a vehicle and good hearing is capable of conducting a Nightjar Survey! We request all volunteers sign our volunteer waiver form and adhere to our roadside safety protocols. Contribute to the conservation of unique species! 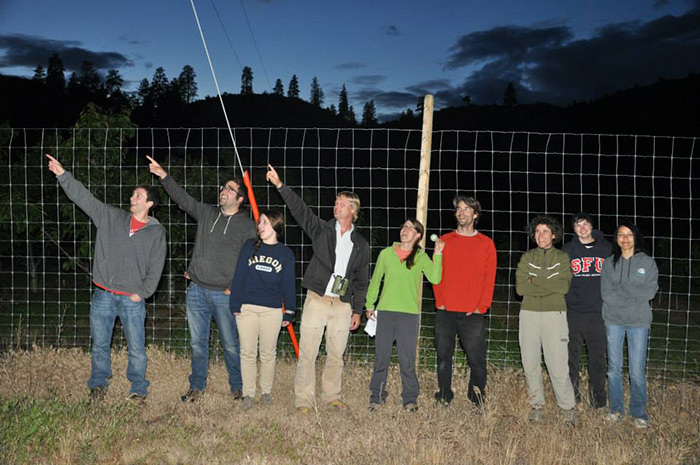 The Nightjar Survey is conducted solely with the help of volunteers like yourself! WildResearch is always looking for more volunteers to survey for Common Nighthawks, Common Poorwills, and Eastern Whip-poor-wills. For more information about the Nightjar Survey, visit our Information for Surveyors page or email us at nightjars@wildresearch.ca.